After the celebrations, reflections and developments during a very significant Reconciliation Week, we now look to the many events of NAIDOC week to celebrate the cultural and resilience of Australia’s First Nations peoples. The 2017 National Constitutional Convention at Uluru in the lead up to Reconciliation Week, provided an important statement to lead the debate about real change to bring justice for Aboriginal and Torres Strait Islander people. At this end of this email is an extract is from an email communique from ANTaR following the release of the statement, and the full statement is available on the ANTaR website. At the end of Reconciliation Week, Tyronne Bell from Dharwra Aboriginal Cultural Tours introduced a group of ANTaR ACT supporters to Mt Majura as seen by those who lived here for tens of thousands of years. You can see pictures and read more about the tour in this article. The theme this year for NAIDOC Week is Our Languages Matter. This theme ‘aims to emphasise and celebrate the unique and essential role that Indigenous languages play in cultural identity, linking people to their land and water and in the transmission of Aboriginal and Torres Strait Islander history, spirituality and rites, through story and song.’ You can find out more at this link. There will be many events in Canberra during NAIDOC week, including those highlighted here. You can also view NAIDOC events at the NAIDOC website. With stalls and entertainment, for all the family. The ACT NAIDOC committee is also organising the NAIDOC Week ball on 1 July and other events. For more details see their Facebook page. Hosted by Community Services #1, the Smith Family, Woden Community Service, Marymead, ACTCOSS and Northside Community Service. This will include art, entertainment, stalls, stories and lunch, with all ages catered for. All are welcome, with no charge and no RSVP required. Please call 6126 4700 for any enquiries. For more information see the Belconnen Arts Centre website. This exhibition showcases artworks from the Alexander Maconochie Centre and the community. An initiative of Community Services #1, ACT Corrective Services and Campbell Page. Everyone is welcome at a Family and Community and NAIDOC Game Day day being hosted by Boomanulla Raiders Rugby League Club on 24 June at Keith Tournier Ovals in Ainslie. The Raiders will be playing the UC Grizzlies and there will be a variety of activities. More information about the Boomanulla Raiders and the Family and Community Day is at their Facebook page. We hope to see you there! 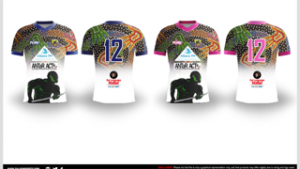 To help support the club and Indigenous Rugby League in the ACT, ANTaR ACT has co-sponsored special NAIDOC week jerseys for the men’s and women’s teams (seen here) by talented local artist, Esma Livermore. These will be auctioned off after the game with proceeds going to Gugan-Gulwan Aboriginal youth centre. CORE is holding the eighth in a series of gatherings to offer the opportunity to listen and learn from First Nations speakers and those who have committedly worked with them. The speakers share something of their life experience, visions and concerns. The speaker at this gathering is Valerie Albrecht whose presentation is titled “Working in Health in Remote Communities – What I learnt to make a difference.” Valerie will then host a panel discussion on the topic with George Villaflor, Aboriginal lawyer, and others. To help us with organising refreshments please RSVP by 22 June to Gedda Fortey gtfortey@gmail.com or David Purnell – david.christine@iinet.net.au. ANTaR ACT is planning to have stalls at the NAIDOC Family Day on 2 July and the NAIDOC by the Lake on 8 July. Please come and say hello. The next ANTaR ACT monthly meeting will be held on Monday 3 July 6pm, at King O’Malleys, in the Snug Room behind the bar. In our June meeting, we were pleased to meet with Deborah Evans from Tjillari Justice – more information about the work they do will be in our next newsletter. ANTaR supports the Statement, which represents substantive reforms, including through constitutionally enshrined recognition of an Aboriginal and Torres Strait Islander Voice to parliament, rather than a minimalist proposal of acknowledgement only. The Statement also proposes a process for agreement-making between the government and First Nations peoples, something ANTaR has supported since its inception. “Makarrata is the culmination of our agenda: the coming together after a struggle. It captures our aspirations for a fair and truthful relationship with the people of Australia and a better future for our children based on justice and self-determination. “We seek constitutional reforms to empower our people and take a rightful place in our own country. As we have done for nearly 20 years now, ANTaR will be supporting Aboriginal and Torres Strait Islander voice and we will continue to walk with First Peoples on this journey towards more just foundations for First Nations people of Australia.